Dental implants are replacement, or substitute tooth roots, used to replace natural tooth roots in areas where teeth are missing. Dental implants are fabricated of titanium and are placed into the jaw where they bond with the jawbone to form virtually permanent supports for replacement teeth. This bonding process is known as “osseo integration”. Natural tooth roots are embedded to the bone. Their job is to stimulate bone growth and provide a stable foundation necessary to bite and chew. When all or some of your teeth are missing, the jawbone is not being stimulated and as a result the area of bone in which teeth are missing deteriorates rapidly. In addition, as the bone shrinks away your muscles migrate, or pull back from their natural position. Complete tooth loss and the deterioration of the jawbone can also result in significant overall health problems related to improper digestion, from not being able to chew your food properly. 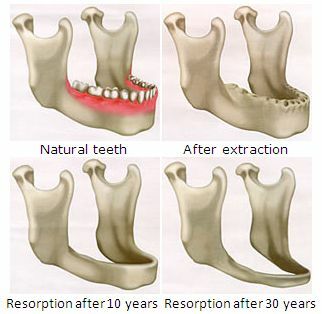 Over time, as the bone resorbs (shrinks) facial structures continue to collapse, and the dentures must be relined (made thicker) to compensate for additional bone loss. Your lips cave in as they lose support and wrinkles increase dramatically as your facial structures collapse. This leads to the appearance of jowls and witch’s chin. Dental implants act as artificial tooth roots and since the bone actually bonds to the titanium in the dental implant, they serve the same function as the natural tooth roots, providing continued bone stimulation and stable foundation, as well as helping to prevent the related health problems that would normally occur with complete tooth loss. Replacing your teeth with implant supported overdentures will preserve the bone and prevent the further deterioration of facial structures.